Pulling out the projector assembly and testing the fans, found them to be working perfectly. 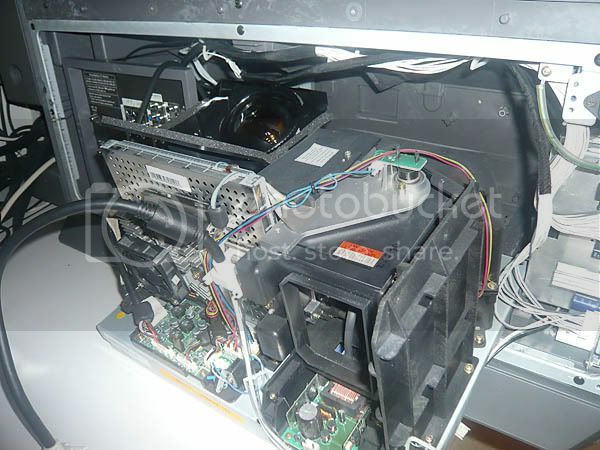 So I started searching technical websites and disassembling the unit further. Many users seem to have experienced problems with loud buzzing and distorted colors, and most stemmed from a broken color wheel. The color wheel is not visible in this image, but can be found to the right of the projector lens, underneath the black plastic cover with the square white sticker. Getting down to the color wheel I find that it is clearly broken. 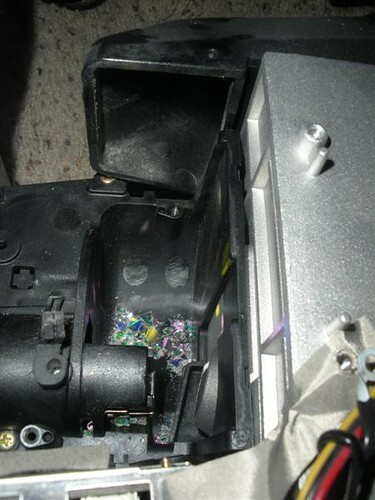 There are glass shards in the bottom of the housing and the wheel itself is broken (see below). This is what the broken color wheel assembly looked like. The edges should be uniform circular, and the wedge missing should be there as well. It appears that the wedge came as it was spinning and then crashed into the wheel, shattering itself and damaging additional panels. Now unbalanced, the timing of the color system is shot and the picture appears as a black and white image with random colors applied. When ordering a new color wheel, take note of your model number carefully. My unit is a model HLR5067WX (note the X on the end) and has an L3 chassis, which requires a model BP96-00674A Color Wheel (~$125 on Amazon). The model HLR5067W has an L6 chassis, and uses a model BP96-01103A color wheel (~@88 on Amazon). Both model chassis' and color wheels look nearly identical, with the only apparent difference being a only a few millimeters difference in the mounting rails. But they are NOT interchangeable.